Happy to report build 1739 fixed iOS 8.3 sync issue. Thank you! Also not able to sync since iOS 8.3 update. For me it is hanging on sync - looks like it is progressing and then just hangs. Still experiencing lockups during startup - each time requires killing the process in task manager. I have tried the latest release 4.1.1.1702 and still experiencing fairly consistent lock ups. I have sent a few debug files and will be downgrading to 4.07 so I can continue to use MM. So far have not had any crashes. Thank you nohitter151. Will install it now and report back. iPod Bookmarking did work for all file types in MM3. It was configurable. Could anyone shed more light on iPod bookmarking and MM4? Actually I have enabled bookmarks for all the default file types but bookmarks are not working for anything. Lowlander wrote: It actually is defined by Genre: http://www.mediamonkey.com/forum/viewto ... 74#p299374, but this only is done when files are added to the Library. Afterwards Genre changes don't invoke Type changes as you can manually adjust the Type yourself in the Properties window. Lowlander - thanks for the reply. I have noticed that default types are not defined by genre, ie I switch a track to the genre of podcast and it still does not bookmark. What defines the criteria for the default types -what is MM looking at when it recognizes something as a podcast? 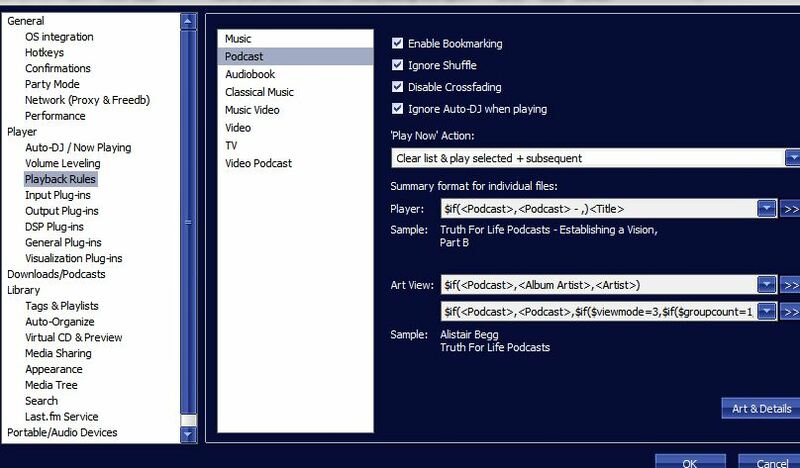 I see that under "playback rules" there is the option for enabling bookmarking for those file types listed (music, podcast, audiobook, etc.) - but is it possible to enable bookmarking for files of a certain genre? or possibly a given collection? I am a huge fan of this script - thanks! I had to reinstall windows and I am now running windows 7 64bit. When I try to install using the installation package I get an error which says "product installation error". I would appreciate help in getting the script working again - thanks again.